For more than fifty years the words “chronic fatigue” have been synonymous with the first stage of a condition known as systemic fluorosis, or chronic fluoride poisoning. In fact, so well known is that particular association that motion picture director Stanley Kubrick would use it in his dark satire, Dr. Strangelove, to describe the moment his character, Gen. Jack Ripper, came to develop his fruity theories on the dangers of fluoridation. By contrast, only a handful of the world’s leading experts on fluoride toxicity have long been aware that the symptoms of the emerging condition known as “fibromyalgia” exactly match those of the most severe form of fluoride poisoning. This little known fact was quietly highlighted by the intense focus on potential Sarin gas exposure for the nearly 200,000 veterans of the first Gulf War who have quietly become the largest single group to ever develop fibromyalgia. Despite the lack of evidence of mass exposure, it remained telling that the top authorities on a nerve gas known to derive all of its toxicity from fluoride proved they could not tell the difference between the lingering effects of Sarin exposure and the symptoms of fibromyalgia. While the majority of veterans blamed the preventative medications they’d been forced to take as the source of their illness, fearful military leaders shifted the focus away from those drugs so quickly that few seemed to notice that Sarin gas was not the only potential source of toxic fluoride exposure. Only as more and more veterans developed fibromyalgia and its related conditions in the years since the end of the 1991 Gulf War, including many who did not even leave the U.S. mainland, have those soldiers and committed researchers been able to slowly pressure the military to focus attention back on those drugs. How the seemingly harmless sounding chronic fatigue syndrome relates to fibromyalgia, a condition that eventually cripples most of those who develop it with a laundry list of debilitating symptoms including: brain fog, severe muscle & joint pain, thyroid dysfunction, muscle spasms, numbness, chronic fatigue, irritable bowel, hair loss, vision problems, spinal & cranial calcification & kidney dysfunction? What hundreds of thousands of largely male veterans might have in common with the estimated 8-10 million Americans, mostly women, who have now developed a crippling condition that seemed to emerge out of nowhere in the early 1980′s? When I developed my case of fibromyalgia from 2 months of Cipro, a widely popular fluorinated antibiotic that is normally prescribed for 7-10 days at a time, no one really knew why I’d become sick. But that changed in late 2001, when many of the key questions regarding fibromyalgia were unexpectedly answered. For as a few anthrax-laced letters made their way into the U.S. mail system, thirty thousand people were suddenly put on 2 months of that very same medication. While most had not been exposed to anthrax, the CDC encouraged that Cipro be used for an extended course as a purely precautionary measure. However, as the medical community closely monitored those individuals, they began to notice the appearance of disturbing side effects. So severe and so widespread were those side effects in fact, that many were openly encouraged to stop taking the drug and switch to a “safer” medication. For a drug that had been prescribed over 200 million times, largely to women with urinary tract infections, the medical community was at a loss to explain why the extended treatment seemed to lead to such a widespread reaction. Things only worsened over time though. Among those who had stopped taking the medication, many began to realize that their so-called side effects were actually permanent. And even more remarkably, many months after the treatment, it was observed that everyone of those sampled that had completed the full two month treatment appeared to develop those same, permanent, crippling symptoms; symptoms that exactly match those of the emerging condition known as fibromyalgia. Not an allergic drug reaction as it turned out, but rather a universal toxic reaction to a fluoride based compound known as fluorophenyl. The same compound found in the now infamous cholesterol-lowering drug Baycol and weight-reducing drug, Fen-Phen. While the impact of Fen-Phen on the heart muscle consumed most of the focus back in 1997, some fibromyalgia groups have since tried to bring attention to the fact that the drug also appeared to be linked to fibromyalgia and its related conditions. Such a connection was highlighted for me when I met one of the longstanding support group leaders of the Minnesota Chronic Fatigue Syndrome & Fibromyalgia Assoc., who had developed her disabling case of fibromyalgia (which eventually put her in a wheelchair) after an extended treatment of Fen-Phen. Already deeply concerned over studies demonstrating fluoride’s considerable power to mutate genes, EPA scientists began to move aggressively against the controversial additive they had long supported after learning that one of the most prestigious dental research centers in the U.S., the Harvard-affiliated Forsyth Institute, had recently proven that fluoride was also severely neurotoxic. As similar studies appeared to confirm those disturbing findings, investigative journalist Joel Griffiths would inform Forsyth’s noted neurotoxicologist-turned whistleblower, Phyllis J. Mullenix, that her so-called discovery was not in fact a discovery at all. For not only had the 20th century’s top experts on fluoride toxicity, Kaj Roholm & George Waldbott, long warned of fluoride’s severe central nervous system effects, but recently declassified documents revealed that the original champion of fluoridation, Harold C. Hodge, one of America’s most influential toxicologists, who in his final days guided every step of Mullenix’s research, had long ago buried evidence demonstrating the extreme neurotoxicity of fluoride himself. The startling documents, uncovered by journalists in the wake of a 1995 presidential investigation, revealed that while supervising the injection of toxic doses of radioactive plutonium into unsuspecting hospital patients to gauge its effect on the human body (as Director of Toxicology for the Manhattan Project), Hodge had simultaneously championed the idea of dumping toxic fluoride waste into the water supply under the guise of protecting children’s teeth. Only, with millions of tons of fluoride waste generated from the enriching of uranium, Hodge’s only concern had been to find a way to dispose of the massive amounts of fluoride required to make nuclear weapons. With the threat of an arms race already looming, Hodge invited the research labs of major industrial fluoride polluters to help cover up evidence of fluoride’s extreme toxicity, including its central nervous system effects, all in the interest of “national security.” On January 25, 1945, five days after the uranium diffusion plant in Oak Ridge, Tennessee became fully operational, Hodge achieved his secret objective, as Grand Rapids, Michigan officially became the first city on earth to be artificially fluoridated. 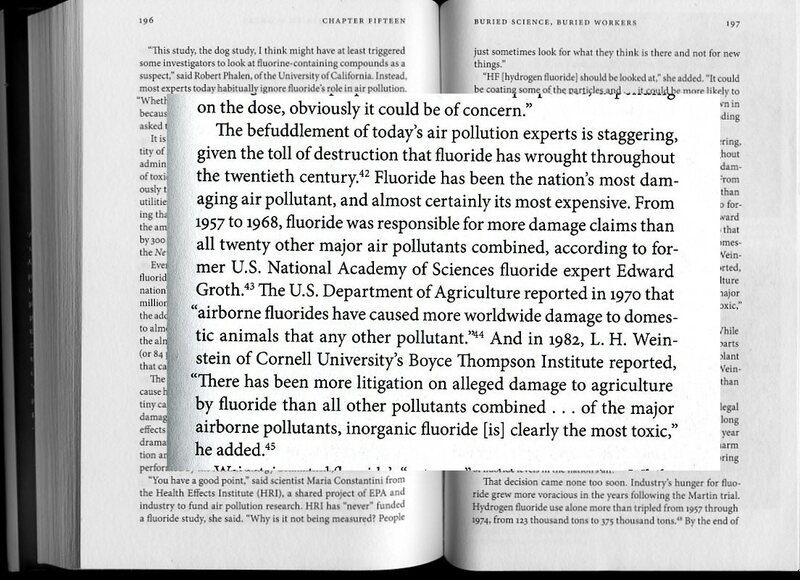 In August of 2005, just months after journalist Chris Bryson’s landmark book “The Fluoride Deception” revealed new evidence of buried research by the men who had supposedly proven fluoride’s safety on behalf of the dental community, 11 EPA unions, representing more than 7000 public health toxicologists, chemists and other scientists, joined forces to call for a nationwide moratorium on fluoridation and a congressional investigation into its adverse effects. With alarm over the brain and kidney damaging effects of fluoride growing, concerned scientists have begun to observe how closely the symptoms of fibromyalgia and its related conditions appear to match the symptoms of chronic fluoride poisoning. While few paid much attention to the list of symptoms described by Dr. George Waldbott, M.D., the founder of the International Society of Fluoride Research and corresponding scientific journal “Fluoride“, when his 1978 book “Fluoridation: The Great Dilemma” was first published, those familiar with the fibromyalgia related conditions have been struck by the apparent connection. the skin that fade and clear up in 7-10 days. Skin rash or itching, especially after showers or bathing. Thanks to medical specialization and the often-slow progression of symptoms, those who develop most of the major symptoms of chronic fluoride poisoning and are eventually diagnosed with “fibromyalgia”, frequently share the experience of being treated like hypochondriacs, as one symptom after the next emerge, are diagnosed & treated separately by physicians. As a result, by the time the condition advances to include nearly the entire list of symptoms (including debilitating “brain fog”, or what Waldbott termed the “loss of mental acuity and ability to concentrate”), the fibromyalgia diagnosis has often been preceded by such labels as “chronic fatigue syndrome”, “depression”, “hypothyroidism”, “irritable bladder”, “irritable bowel syndrome”, “multiple chemical sensitivity syndrome”, and “myofascial pain syndrome”, among others. Labels aside, whether or not those who suffer from fibromyalgia have been officially diagnosed with each of these related conditions, the overwhelming majority have symptoms of each and therefore understand from experience that they are all elements of a single underlying condition. Although the relative newness of fibromyalgia and many of its related conditions are often debated, what is not is that medical specialists began observing their sudden widespread appearance beginning in the early 1980′s. In fact, so dramatically did the number of those suffering from the most debilitating symptoms ramp up, that by the end of the decade, Frederick Wolfe and the other leading rheumatologists who had only just gathered to define “fibromyalgia” a few years earlier, abruptly went their separate ways under mounting pressure to explain its sudden emergence. While the focus of the fluoride controversy has long been centered on the water supply, the anthrax letters of 2001 demonstrated how highly toxic forms of fluoride now available in select prescription drugs may be playing a considerable role in the emerging epidemic. For if a fluorinated antibiotic like Cipro (in a drug class developed in the early 1980′s), can universally induce what is essentially the most severe form of fluoride poisoning in just 2 months, imagine how far down the road all those women are who have consumed mere weeks of the widely popular antibiotic. All this brings to mind the key objection of the 14 Nobel Prize winners in Chemistry & Medicine, including the 2000 Nobel Laureate for Medicine, Arvid Carlsson, that have warned against the practice of dumping fluoride waste into the nation’s water supply. For even before fluoride was known to be severely neurotoxic by more than a handful of experts, some of world’s top scientists expressed grave concerns about the potential long-term damage that might result from adding the powerful enzyme poison to any substance that might be ingested, given its ability to accumulate in the human body. Ironically, not only have such warnings not been heeded, but it is precisely because of fluoride’s cumulative nature that it has been increasingly added to prescription drugs. In adding an element that does not tend to leave the body, fluorinated drugs become significantly more potent than their non-fluorinated counterparts. However, as the leading experts in fluoride toxicity have cautioned for decades, there is also a huge risk in adding even minute quantities of fluoride to each new drug. For not only do they add to the already dangerous levels of the cumulative neurotoxin in our diet, but it is entirely possible that certain prescription drugs could potentially fragment within the human body and reform hyper-toxic fluoride compounds, such as fluoro acetate. Given that there is a well-known delayed reaction between the point such forms of fluoride enter the body (or are formed in the body), and when symptoms begin, each new drug represents a potential time bomb; a truly nightmarish scenario made infinitely more likely with an FDA run by Wall Street analysts, appointed specifically to fast track drugs and allow drug companies not to have to monitor their long-term, chronic toxicity. That there was a delayed reaction in the onset of symptoms for most veterans of the first Gulf War, as well as the victims of the anthrax letters treated with Cipro, it seems increasingly likely that fibromyalgia represents just such a worst-case scenario. Regardless of the specific form of fluoride involved though, perhaps the most compelling evidence linking fluoride to the cause of fibromyalgia may actually be reflected in the work of a few leading fibromyalgia researchers, who have unknowingly been uncovering key elements of chronic fluoride poisoning that have long been the focus of the top experts in fluoride toxicity…. Garth and Nancy Nicolson – renowned immunologists who began studying fibromyalgia when their daughter returned home from Iraq at the end of the first Gulf War complaining of symptoms. In developing the highly sophisticated mycoplasma test, the Nicolsons demonstrated that immune dysfunction was a key component of fibromyalgia. Discovered that male veterans afflicted with the condition appeared to spread fibromyalgia sexually to their female partners through an unusually high incidence of recurring urinary tract infections. Presumably unaware of the potential connection to fluorinated antibiotics, the Nicolsons went on an unsuccessful search for a potential contagious biological agent that might be able to explain the rapid rise in fibromyalgia. Today, I know I owe my very life to whistle blowers like Dr. Phyllis Mullenix. While the noted neurotoxicologist only highlighted one particular element of fluoride poisoning, it was a critical one that allowed EPA scientists and others to begin to open their eyes to the growing body of independent scientific research that has slowly begun to expose “fibromyalgia”, “chronic fatigue syndrome”, and a variety of related conditions, as merely labels for the various symptoms, or stages, of chronic fluoride poisoning. Dr. Don Goldenberg, the noted rheumatologist who first introduced fibromyalgia to much of the medical community with his 1987 article in the Journal of the American Medical Association (JAMA), once wrote of fibromyalgia, “We should concentrate on treating the symptoms of chronic illness, not searching for a cause.” His statement mirrors the current mindset of much of the medical community, who offer to treat the myriad of debilitating symptoms related to fibromyalgia as if they are wholly unrelated to one another, as if the cause doesn’t matter. Well, I can tell you from experience, the cause certainly does matter. 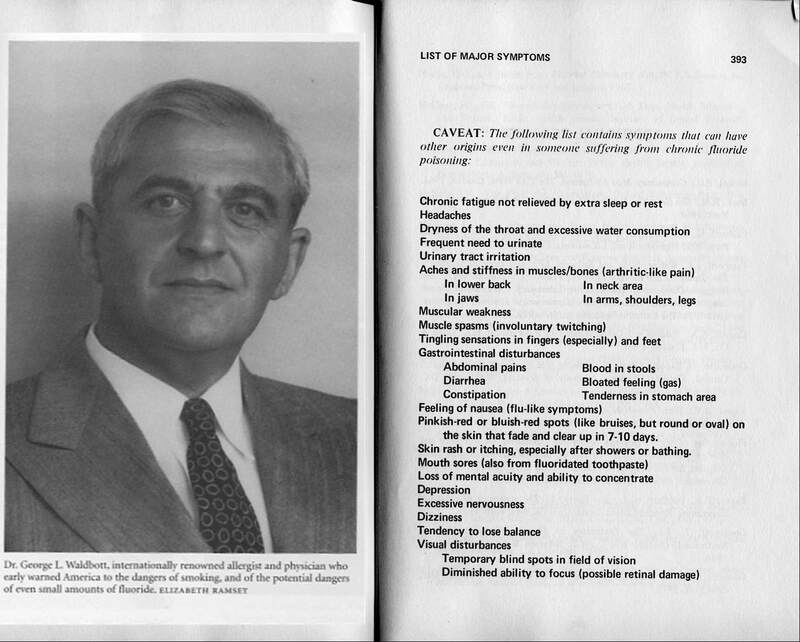 Image #2: Image is of Page 393 of George Waldbott’s 1978 book “Fluoridation: The Great Dilemma”, which was written in collaboration with Albert W. Burgstahler, PhD and H. Lewis McKinney, PhD. Waldbott was the founder of the International Society of Fluoride Research and the “Fluoride” science journal. Waldbott was regarded as one of the 20th century’s top experts in fluoride toxicity. Image #4, Part 1 & Part 2 (.pdfs): CFS Journal article by Julia A. Laylander published in 1999 highlights the emerging scientific evidence linking Chronic Fluoride Toxicity to Chronic Fatigue Syndrome and Fibromyalgia. Learn how to test your sensitivity to fluoride and see answers to other important fluoride related questions. To submit a new question, please contact Jason at juttley@hotmail.com. Robert J. Carton – “Fluoridation is the greatest case of scientific fraud of this century, if not of all time.” Twice elected to lead the union of EPA scientists in Washington D.C., Carton wrote the first EPA regulations for controlling asbestos discharges and was among the first scientists at EPA Headquarters to question the extreme toxicity of fluoride and its related health effects. “Fluoride, the official quarterly journal of the International Society for Fluoride Research (ISFR), is published for the advancement of research and dissemination of knowledge pertaining to agricultural, analytical, biochemical, biological, chemical, clinical, dental, ecological, environmental, industrial, medical, metabolic, pharmacological, synergistic, and toxicological aspects of inorganic and organic fluorides or fluorine compounds. Copyright February, 2007 Jason A Uttley. Not to be reproduced without the express written permission of the author.